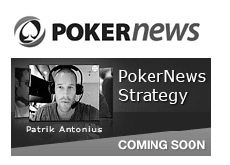 If you visit Pokernews.com, you will notice a banner on the right-hand side of the page that says "PokerNews Strategy - Coming Soon", with a picture of Patrik Antonius wearing a headset. PokerNews Strategy is slated to be another instructional site that is entering an already crowded market. You have Cardrunners. You have DeucesCracked. You have PokerVT. You have PokerXFactor. You have RealPokerTraining. You have StoxPoker. The list goes on and on. Having a stacked line-up of instructors is obviously key to making a dent in an already crowded market. Having Antonius and "Genius28" on the team will obviously help tremendously when it comes to recruiting members. Antonius is worth his weight in gold, as he is easily one of the most popular and revered players in the world. PokerNews Strategy is taking the videos a step further by actually showing the instructors on-screen when they are filming a video. The screen will be split into two - on one side, you will see the online poker table that the instructor is playing on. On the other side, you will see the instructor as he plays and coaches. I'm not sure how necessary it is that we actually see the instructor as he plays, but I'm sure that this feature will certainly help to bring in more subscribers. The site hasn't launched as of yet. There is no information (as of yet) in terms of pricing. As soon as we hear anything, we'll let you know.